This male Luzon Hornbill was hopping from branch to branch, feeding on the fruits of a balete tree (local fig tree) at Mt. Makiling in 2007. I was following it through the Canon 20D’s viewfinder (my camera was in portrait orientation), wishing that it pauses for a moment. My shutter speed was at 1/80 sec because I wanted to use a maximum of ISO 400 for better processability of the RAW files later. But this shutter speed was way too slow for an active subject…. the bird better stop moving otherwise I wouldn’t get a chance. Even bumping the ISO to 800 and opening the aperture to f/5.6 from f/6.3 would only yield 1/200 sec – still slowish to stop subject motion. The birding gods must have heard my wish. 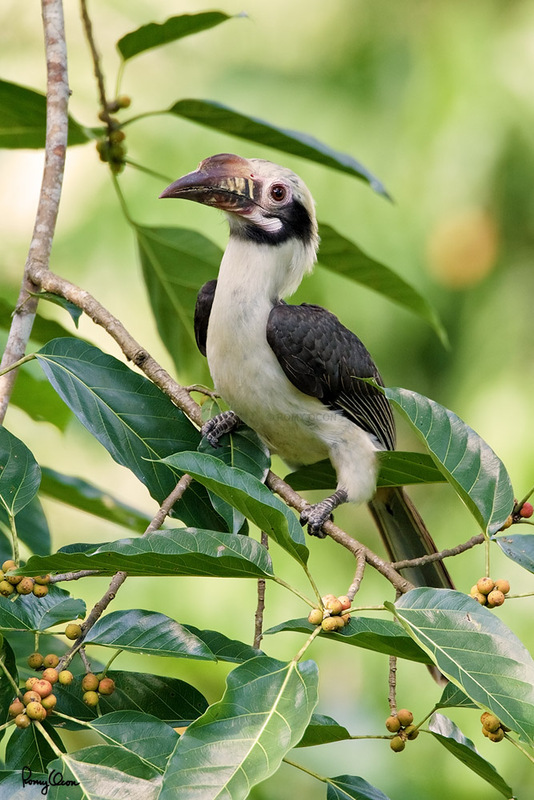 For a couple of seconds, the hornbill stopped hopping and feeding and briefly stared at me. That was enough window of opportunity to get a shot that I like - with strong eye contact, good detail even with the slow shutter and a “well groomed” branch/foliage surrounding the subject. Habitat – Forest and edge up to 1500 m.
Shooting info – Mt. Makiling, Laguna, Philippines, Canon 20D + EF 500 f4 IS + Canon 1.4x TC II, 700 mm, f/6.3, 1/80 sec, ISO 400, manual exposure in available light, near full frame, 475B/3421 support.